Leif Vollebekk has returned after 2013’s lovely North Americana to bring us a masterpiece, Twin Solitude, which should cement his place in the pantheon of contemporary Canadian singer-songwriters. Vollebekk has mostly traded in his guitar for piano on this album, using sparse, sustained chords that make room for his most excellent rhythm section, composed of Shahzad Ismaily (Marc Ribot, Bonnie “Prince” Billy) and SecretCheifs3 (no idea) on bass, and Olivier Fairfield (Timber Timbre) on drums. Vollebekk has always had impeccable taste in choosing his supporting cast, and the results here are groove-heavy and evocative arrangements that highlight Vollebekk’s best weapon: his vocal delivery. Vollebekk is a seriously smooth singer, drawing frequent comparison to Jeff Buckley. I can see that, but I can better see the influence of Joni Mitchell on this record—if there’s a sister album to Twin Solitude, I would mark Mitchell’s Night Ride Home as a strong contender. Both share freewheelingly effortless vocal phrasing that evokes the sort of exalted sad ruminations one has on a long evening drive. They also are an example of a pegged “folk” artist working more in the domain of adult contemporary (I don’t mean that sneeringly). 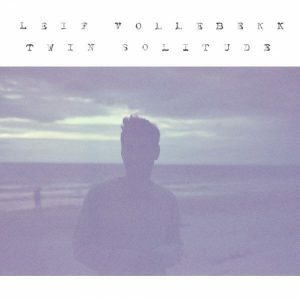 Put another way, Vollebekk works with meditative grooves on Twin Solitude, which allows his voice to deliver surprising and often very touching turns of phrase. The poet Wordsworth memorably defined poetry as “the spontaneous overflow of powerful feelings” taking its origin from “emotion recollected in tranquility”. This applies broadly to Twin Solitude also, and the foremost feeling under consideration is melancholy. In keeping with Wordsworth’s spontaneity, Vollebekk’s songs for Twin Solitude were apparently written quickly, often in one sitting, relying more on intuition than detached craftsmanship. What this means for me is that the music and lyrics are inseparable—it wouldn’t make sense to dissect or examine the components of this music in the way you could say, with the lyrics to Leonard Cohen’s “Anthem” or Hejira’s chord structures. Rather, Twin Solitude should be experienced and felt in the same way it was created: intuitively, without reflex. Felt this way, you may experience an ecstatic connection (as I did) to the way Vollebekk sings “quit putting me on” or “take a look at me now”, phrases which are about as interesting on the page as a mayonnaise sandwich. Twin Solitude practices this kind of special alchemy, turning what might be mundane (a long drive, a disgraced romantic memory, a trite phrase) into something beautiful—hungry and touching. And I believe this is how most of us viscerally experience these mundane things, eager though we may to retrospectively downplay, problematize, or poke a pin in them. These are valid reactions, but often so is the primal feeling that prompted them. This is an album for the individual, detailing the sort of feelings most of us cherish in the privacy of memory and heart. This is not a unique orientation, especially in the singer-songwriter world, and today I find myself seeking music that calls me to the barricades, or invites collective solidarity. I love music like that so much. But I also love to see a thing done well, and I love oases from scoundrels and cruelty, and I love affirmations of beauty. And I love Twin Solitude.